From the competitive ports of China, to the innovative flood gates of the Netherlands, to the shifting sands of the Outer Banks, the sea creeps farther up the coastline every single day, and the distance between the top of the water and the bottom of bridges decreases — a major issue for port economies. UNC American studies professor Rachel Willis searches for solutions to help these communities cope with the impact of sea-level rise. Orange traffic cones surround a fluorescent yellow-garbed construction worker on NC-12. He raises his hand perpendicular to the roadway, signaling to slow down with a weathered red stop sign. As cars speed past in the left-hand lane, enormous cranes on ocean barges lift heavy beams onto a bridge being built alongside the existing one. 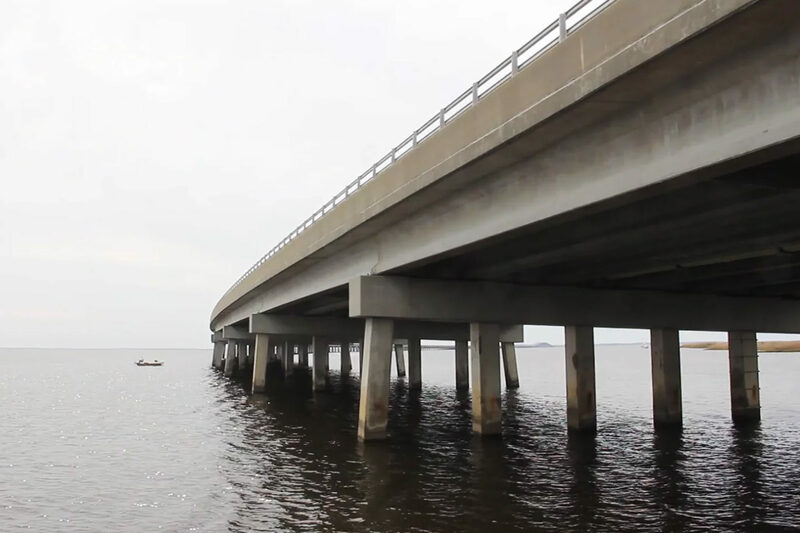 More than 14,000 vehicles cross the Herbert C. Bonner Bridge every day — a lifeline for the people of Ocracoke and Hatteras islands, connecting them to the Northern Outer Banks. Below the bridge, tides from the Atlantic Ocean push into the widening Oregon Inlet, breaking through to the Pamlico Sound. The Bonner Bridge Replacement Project began on March 8, 2016. The new structure is designed to withstand 100 years of ocean currents, built with high-durability concrete and reinforced stainless steel. But it comes after years of failed attempts to create a durable bridge and countless arguments over environmental concerns. Constant beach erosion, severe weather, and high traffic volumes have regularly compromised the state of this roadway since its completion in 1963. In 1990, in the middle of the night, a state trooper watched a dredge collide with the bridge during a brutal nor’easter, causing 400 feet of roadway to collapse into the waves below. For three-and-a-half months, Hatteras Island could only be accessed by boat or plane. In 2013, safety concerns closed the bridge for 12 days when routine sonar scanning showed that substantial sand erosion had compromised the support structure. And in the summer of 2017, construction crews struck major underground electrical cables, knocking out power to Ocracoke and Hatteras islands for weeks. Since the bridge’s original construction, more than $300 million has been spent to protect and repair it. Rachel Willis watches the bridge construction from the water’s edge on Hatteras Island. She sighs. Willis, a professor of American studies, global studies, and economics, researches the intersection of transportation infrastructure and sea-level rise. How does a labor economist end up studying climate change? The answer is not one you’d expect: socks. In the early 1990s, Willis and students compiled data from every child care center in North Carolina — research that contributed to the development of Smart Start legislation. In 1994, while presenting this research at a conference, she met a sock manufacturer who would eventually introduce her to Dan St. Louis, an industry specialist who created training programs to help factories better communicate with employees and help workers become better contributors. Over the next 10 years, Willis followed the lifecycle of socks around the world. She traveled to Italy to learn where the machines were manufactured, to China to understand business practices of the United States’ soon-to-be biggest competitor, and to the Czech Republic to see where all the Soviet Union sock-knitting machines were made. In North Carolina, she visited more than 200 sock factories and interviewed thousands of workers, owners, supervisors, and suppliers, among other people in the industry. But it wasn’t just about socks. 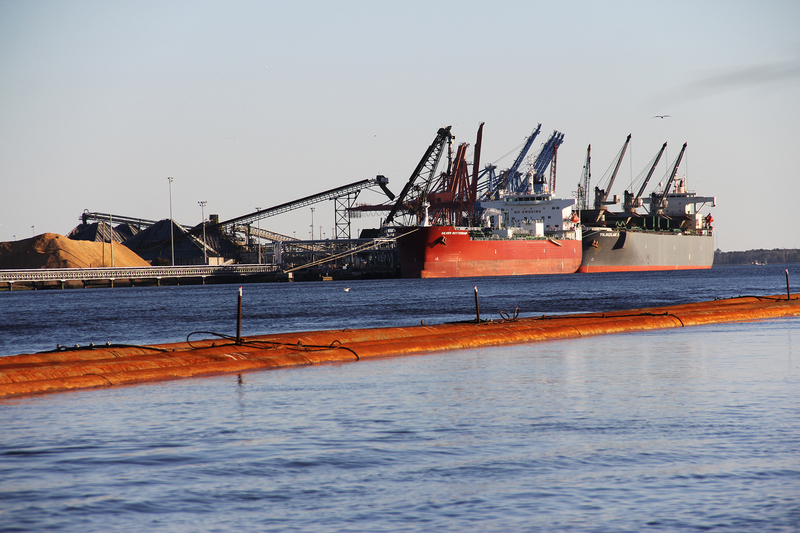 Cranes load freighters with shipping containers at the Port of Wilmington. “The path” forward, according to Willis, involves infrastructure and ports that work with sea-level rise, rather than against it. “The water’s edge is in the path of climate change, which includes more frequent and intense weather events like hurricanes and droughts,” she says. When you drive into Morehead City, you can follow the train tracks all the way to the port thanks to the city’s namesake John Motley Morehead, who, as governor, oversaw their construction in the 19th century. Today, boats still arrive at the port and directly load goods onto the trains, which make deliveries to local factories and villages along the corridor. Here’s why Willis believes the nation must put goods on railcars and then get railcars to ports: It costs about 80 cents per mile to move one metric ton of freight on an airplane. It costs 27 cents to move it by truck. It costs 2 cents by rail. “It costs one penny by water — and also by pipeline,” Willis stresses. These numbers don’t just represent product cost — they are a proxy for the amount of carbon put into the atmosphere to move goods around the planet. The Dutch have a famous saying: “God built the world, but the Dutch built Holland.” About one-fifth of the Netherlands lies below sea level and 60 percent is vulnerable to flooding — startling statistics that the Dutch have learned to live with. Unlike most of the world, they have always worked to maintain a symbiotic relationship with the water. 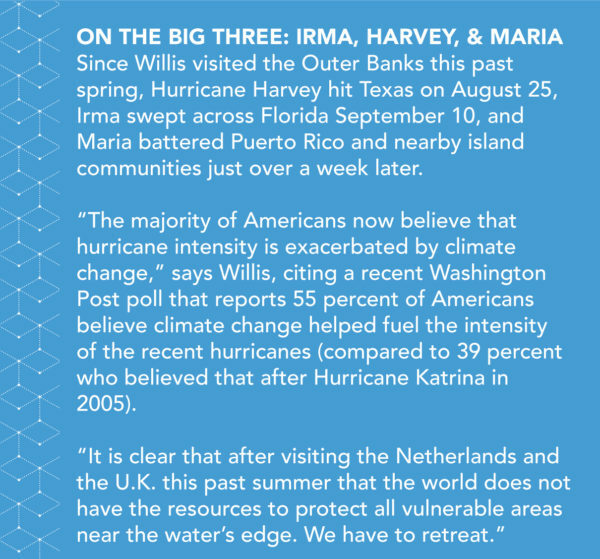 Willis has always been fascinated by Dutch resiliency. And with good reason. In the 13th century, they were already reclaiming land through the construction of dykes after flooding. Two hundred years later, the invention of the rotating turret windmill not only pumped water out of permanently flooded lands — it provided an energy source. Fast-forward to 1852, when the Dutch government reclaimed the land that is now Amsterdam’s Schipol Airport. They spent the next century taking land back from the sea and, in the 1980s, began the largest land reclamation project and erected the grandest flood barrier that the world has ever seen. Twenty-five percent of the Dutch population commutes to work by bike. Here, Willis cycles to Maeslantkering, the flood barrier in the Hook of Holland. The barrier, called Maeslantkering, is equivalent in size to two Eiffel Towers placed horizontally on the water in the Hook of Holland. In 2015, Willis decided she had to go see it for herself. 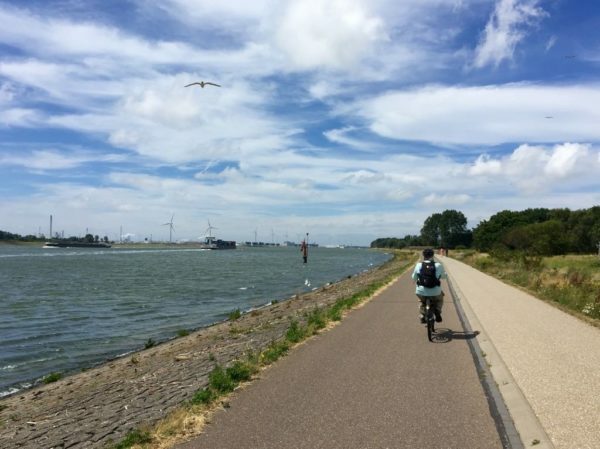 To get there from Amsterdam, she hopped on a wind-powered train (all Dutch trains are powered by wind) and headed to the Hook of Holland, where she rented a bike to complete the rest of the journey. “I biked along the road between the shipping canal and the new high-capacity wind turbines that are powering all their trains,” she says. “It was amazing to see how you can take problems like high winds and turn them into solutions.” She also took a tour of the barrier and got to see firsthand the complex interactions of moving freight transportation. “If you’re looking for an insane field trip, go see where these solutions are in full force,” she advises. Another great example, according to Willis, is the Thames Barrier — which prevents Greater London from high tides and storm surges moving up the North Sea. Stretching 1,700 feet across the Thames, the barrier’s 10 steel gates remain flush with the river floor until a threat of high tide — and then they’re rotated upward, to the height of a five-story building, to block rising waters from entering the city. The whole process takes anywhere from 75 to 90 minutes. “In 2013 alone, the barrier was used 50 times,” Willis says. Since its completion in 1984, the barrier has raised its gates nearly 180 times. Although the Dutch continued to pump water from land in the 20th century, they still encountered problems from flooding. The North Sea Flood of 1953, for example, killed more than 2,000 people and put more than 370,000 acres of land underwater. In response, the government began Delta Works, a series of construction projects involving dams, sluices, locks, dykes, levees, and storm surge barriers to secure and protect the deltas of the southwest Netherlands. That’s why Willis headed to the Netherlands again this past summer — to speak with experts in engineering, infrastructure, and regional planning. In recent years, the Dutch have refocused their efforts on engineering with nature to provide coastal protection. In 2011, they used 21 million cubic meters of sand to form a hook-shaped peninsula called the “sand engine,” which enables the forces of the ocean to deposit sand along the North Sea coast. Willis realizes that these solutions are not financially possible for most of the world’s coastlines including India, Brazil, and even regions of the United States. “The costs are astronomical for all but the wealthiest communities and countries,” she says. “They are simply not in the community’s budget, much less the national or global budget.” The physical resources needed to develop these solutions are also in short global supply, she points out. 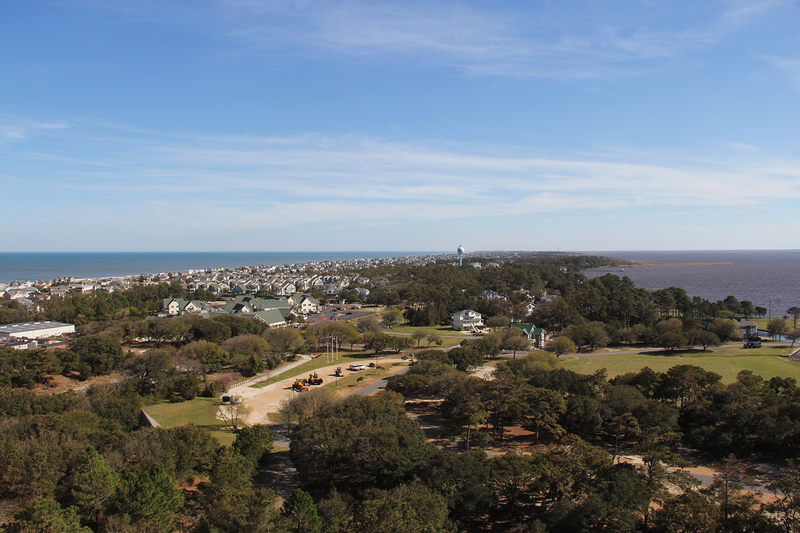 The permanent population of Dare County is approximately 35,000 — that’s six times as large as it was in 1950. In 2016, tourism alone brought in $225.4 million for the state’s economy. But development on the islands of the Outer Banks prevents the shifting sands from doing exactly that, which increases erosion and has caused many houses to, literally, collapse into the ocean. Approximately 50 percent of the world’s population will live within 30 miles of the coast by 2050, according to Willis. What does this mean for neighborhoods, for families that live by the water’s edge? How do we prepare people for threats from more intense storms? Even more importantly, what happens to humans in places that are at-risk now, in places like the Maldives, Vietnam, and the Outer Banks? “I have great optimism about finding solutions,” Willis says. “Because I’ve seen extraordinary examples of them.” She stresses that working toward solutions involves seeing the whole picture. Rachel Willis is a professor of American studies, global studies, and economics within the UNC College of Arts & Sciences. She is currently a Thorp Faculty Engaged Scholar.